Great Investment Opportunity in the Heart of the City of Garland! Beautiful Property with Generous Backyard, Next to Green Belt. Estate Sale to be Sold As-Is. This Cozy Home Needs Updating and it has Foundation Issues. Fantastic for a Flip or as a Rental. Close Distance to Shopping Centers, Schools, Parks and less than 10 minutes to LBJ-I-635. At least 894 Trulia users voted on each feature. "Nothing, it’s pretty dangerous out here and I would recommend moving somewhere else, is not that bad but you can surely get something better"
"N/a Very nice neighborhood nice people lived here since 2003 kids went to the neighborhood school great score"
"Downtown Garland sometimes has events for the community to attend. Other than that, I can’t think of any events that have occurred in my community directly where we live." "lots of stray dogs everywhere. sidewalks are littered with glass and trash or sometimes there's no sidewalks. " "fairly convenient although it takes 15mins just to get to an interstate...walking distance to DART rail though"
"Very friendly nice dogs welcoming community nice friendly people in this area of garland I just moved here and like it "
"lots of traffic, but other than that it's relatively safe. neighborhood is nice, and lots of places to eat and shop nearby. " "Quite helpful friendly safety love to live here, i have everything is close to me.. but I need bigger place "
"Rough looking teens come out of Garland High School. Speedsters regardless of speed bumps. Lots of sirens and honking. Not much for kids to do and the park is not a good place to hang out. Overall Garland is nothing it once was when I was growing up." "The drivers are not always keeping the kids safety in mind around here. Overall, most of us want safe neighborhoods. " "i love the neighborhood. i live here for 25 years already , my kids grow up in this city. they born in this nice neighborhood and go to school and the neighborhood and have a lot of friends. " "I live within walking distance of the downtown Garland square-and the events that take place there on a regular basis, and equally close to the DART rail station, that can whisk me to many more events outside my neighborhood." "I don't commute, I work remote from home. previously I drove to North Plano which was about an hour one way. " "You see dog owners walking their dogs everyday, pretty neighborhood nothing bad around here honestly. It’s very calm and close to a lot of places including two parks one small and one closer to Hawaiian falls easy trip to walk there though either on bike or simply walking a dog. Neighbors are friendly and most stay inside but they ones you do see are kids playing, neighbors gardening, mowing the lawn or people walking with and without dogs." "how safe is the neighborhood? how close is grocery stores. close to highways. low crime area. Friendly neighborhood. " "it is a very nice place to live. people are generally friendly, there are nice Paul's, schools, play areas, restaurants convenience stores and general commerce." "there haven't been any activities in our neighborhood. i would like to plan a block party. i just don't know if anyone would come." "Excellent schools, parks and very family friendly. Neighborhood watch is very active. Crime is low except for minor offenses. Gang activity is low, and the police have a very active presence." "Majority of the town has a very safe atmosphere,there’s really nothing to worry about,everyone casually greets everyone,and other than that we mainly mind our own business"
"Friendly neighborhood. We watch out for each other. Lots of kids playing in yards and two parks and walking trails. " "Dog friendly area. Lots of dogs taking their owners for walks. fenced yards so you are safe from crazed cats." "I've lived in the neighborhood for about 2 months already its honestly quite nice, you can walk across the street to a nice big park, there are thrifts close by and fast food chains. " "Good place, not too bad.I believe is a good place to live store are near by and schools. Alot of parks entertainment for adults and kids. " "This is a nice, safe neighborhood of Garland. No traffic and fantastic schools!" "It is located in a high crime area. I am basing that on first hand knoweldge of Garland and crime statistics provided by the city." "I have lived here for 20+ years. I have had some great neighbors over those 20 years. Fire Wheel Mall is just down the road 3-4 miles and over 15 different restaurants to chose from. Garland is a great place to live. " "The neighbor hood is fairly quite, however, good luck being able to park infront of your own house. There are so many cars parked on the street it's unreal. There is currently a house with 9 vehicles for two drivers and taking up the street. There are ALOT of dogs and cats in the neighborhood, however, they are fairly quite and not a big nuisence. If you can get past all the cars and abudance of trees and mosquitos you will be okay. Also about 3 blocks up centervill is a water treatment plant. The smell is somewhat undesirable at times when the wind carries it this way. We have lived here 3 years and it has been a pretty safe neighboor hood. Mostly quite. All in all I would give it a 6 out of 10." 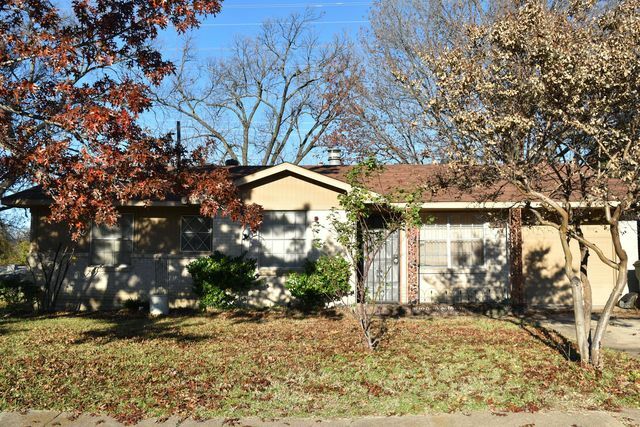 1405 Edgefield Dr, Garland, TX 75040 is a 2 bedroom, 1 bathroom, 1,048 sqft single-family home built in 1962. This property is not currently available for sale. The current Trulia Estimate for 1405 Edgefield Dr is $149,358.